Circa 2014. Selfies became a cultural phenomenon of sorts with 'selfies' being the uncontested winner for Word of the Year 2013. Attaining perfection when it comes to capturing a selfie is a game of balance. There are a number of crucial factors among which balance is essential - be it the focus, the lighting, the number of persons in the frame, or proper framing of a scenic backdrop. More often than not, one ends up neglecting one factor or the other. The narcissus shall then not approve of the hefty bargain as it wishes to accumulate the best of all worlds. Quantity thus outweighs the scales in search of the quintessential quality. Simply said, the entire gallery of numerous phones was filled with captures of 'no-one else but me'. That was not necessarily bad but I needed a reality check right at the start. Every frame has a fable to tell, or so I believe and selfies are no exception. Firsts are special too, and this memoir is about such a special 'first selfie'. The first ever selfie that I captured dates back to 2014 when I was an amateur in selfie-photography. I say 'was' because I have gradually learned the ropes and rarely falter. Picture this. The winter of December 2014. A pleasantly sunny morning in the capital city, Delhi. 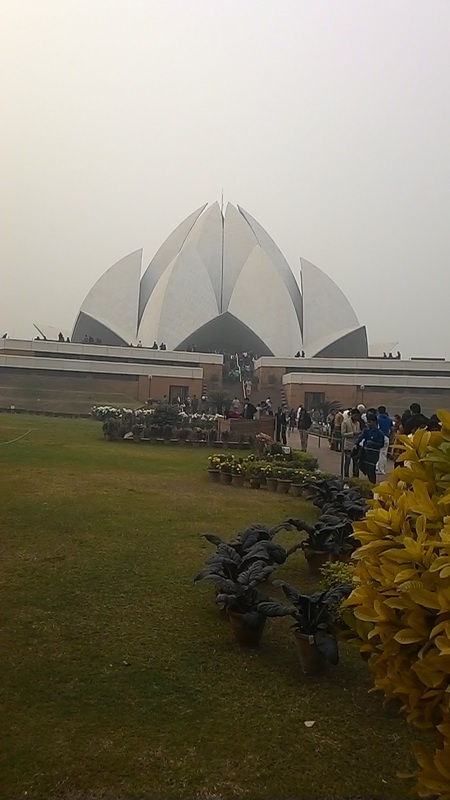 A school excursion to two of the most iconic monuments - Qutub Minar and Lotus Temple. For the uninitiated, a school picnic is the best opportunity for students as well as staff to capture memories on a formal pretext. This excursion was definitely not the first that I was accompanying students on, but it was the first where I could surely explore the selfie phenomenon. 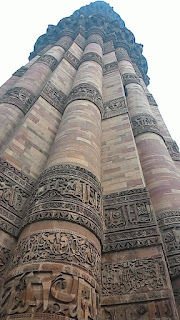 So, among the two landmarks, first on the list was Qutub Minar. Owing to the fact that Qutub complex is a huge one, it took us quite a big chunk of time to explore the intricately carved monument and its peers located in the immediate vicinity. It was upon reaching the Lotus Temple which is as aesthetic to look at as it is revered, that it dawned on me - we had very little time to bask in the beauty and purity of this epicenter of the Baha'i faith in the heart of the city. As much as it had a calming effect on the nerves just by witnessing the architectural wonder in person, there was also a hollow in the heart on having to rush through the visit owing to the fact that the time allotted to parents for the pickup of students back at school was nearing. 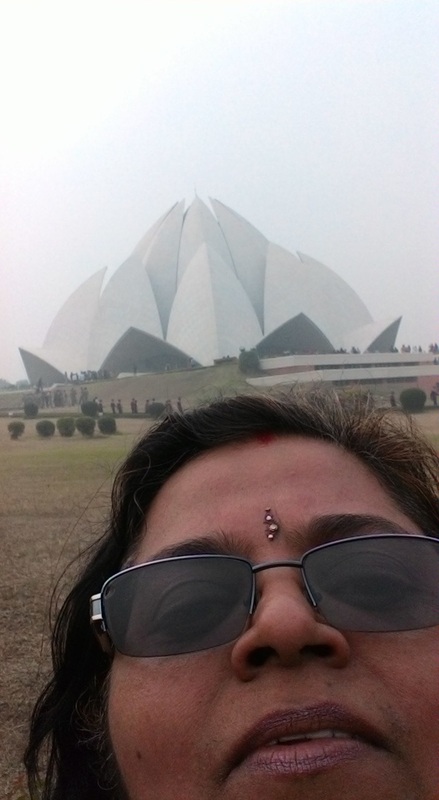 I somehow had my Eureka moment in wanting to absorb the positive vibes radiated by this House of Worship and it then occurred to me that the ever-prevalent selfie trend could come to my rescue, albeit hurriedly. If I had to capture my first-ever selfie at that moment, I had to act fast. However, there were a couple of hindrances blocking the way. My colleagues and students were already at the head of the exit line of the premises, given the fact that all of the students had already boarded their respective buses and my colleagues were calling out for me. All in all, I had the span of a few seconds to focus on and capture this precious memorabilia of a monument in the frame. The fact that the frame should also have me was tricky enough to make or break my selfie game. As much as the picturesque background was set to be captured in all its glory in natural lighting, the same sunlight hindered my view of what was being captured in the frame. I decided to let the monument's presence in the setting vis-a-vis my presence steal the limelight in the capture. It was a make-or-break situation at that moment as I just had to capture the frame, relying solely on my instinct and rush towards the school bus without giving the final result even a glance, as there was no scope for even a second click, with the third being completely out of question. All I did was that I boarded the vehicle with my fingers crossed. My demeanor in that situation could be compared to that of a student waiting for their Board Exam Results. Anxiety and Excitement - two-in-one. It was on reaching home that I opened the gallery and viewed my first-ever selfie for the first time. Although my face clearly reflects the guesswork that was on my mind all the time, I was overjoyed to witness the symbolism of peace in all its eminence with the capture intact. However, there was a slight disruption to my joy as my face had not been completely captured. And, it is the only imperfection that I long to correct to date. How I wished that I should have been in the possession of such a device that could provide a slightly wider-angle shot! I had been consoling myself to date that attaining perfection in any aspect is an illusion, with the anecdote holding true for selfies as well, consoling myself that this capture was not bad at all considering that it was my first-ever attempt. However, the heart pines, as it is in a habit of doing so. On the flip side, such a capture provided me with a much-required reality check. I thus felt that I had managed a pretty good job out of my most precious selfie as I did not let the self reign supreme in the capture. After all, a symbolism of tranquility stands intact in the frame. Imperfections and flaws are the entities that define self, and the same had come to the fore in the capture as well. However, it is today that I felt that my single, most frivolous concern has also been addressed. Thanks to a brand of Vietnamese origin that plans to launch itself in the Indian market tomorrow, my woe concerning this particular memoir can finally be laid to rest. Picture an expertly crafted device boasting of a crisp design and precise technology that offers the ultimate 'Selfie Experience' thanks to a front, dual 'Selfie Camera' that captures a 120° wide-angle shot. As a brand, Mobiistar is all set to treat the Indian audience to the best ever witnessed in the smartphone industry as they partner with Flipkart to become 'Mobiistar on Flipkart' - a range of devices that provide promising battery life with no compromise as far as affordability is concerned. I couldn't be happier as I won't ever have to worry about fitting both the backdrop as well as the smiles precious to me, precisely in a single go. Capturing the perfect selfie, with or without my near and dear ones up close, with the heart of the capture intact - the scenic backdrop - would be an effortless task from now on. Getting my hands on Mobiistar's exclusive devices would mean that I could the perfect selfies seamlessly. P.S. : Images concerning Mobiistar have been taken from IndiBlogger.